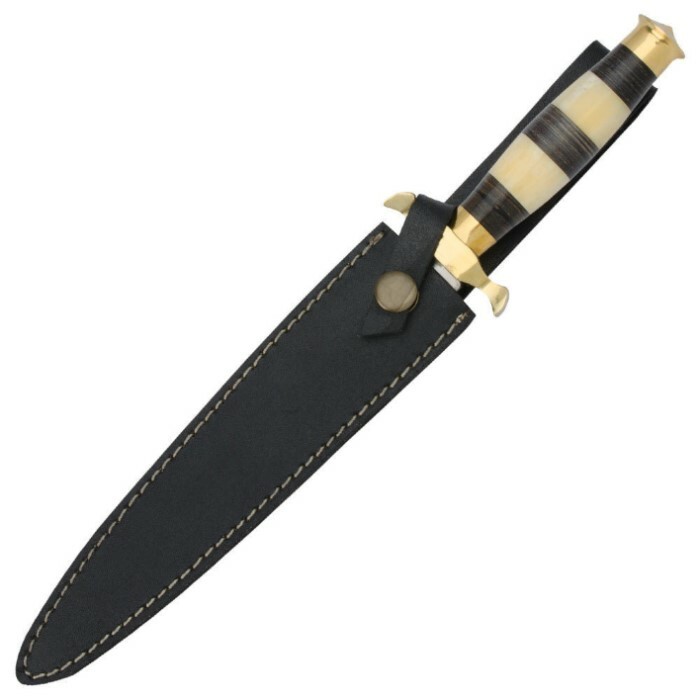 Striped Bone Herdsmans Hunting Dagger | BUDK.com - Knives & Swords At The Lowest Prices! Our classically designed Striped Bone Herdsman's Hunting Dagger features a double-edged stainless steel blade with a piercing point. 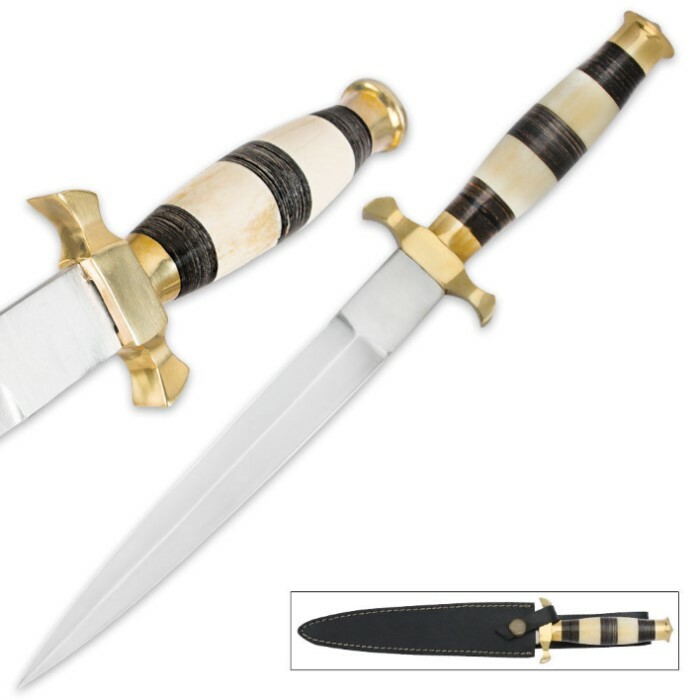 The handle is carefully and handsomely crafted of genuine bone, accented by a gleaming brass guard and decorative pommel. Includes custom leather sheath. This nice dagger had so much potential... So it's really too bad that mine came rusted where the brass touches the black bone on both ends of the handle. Also the blades edges came in terrible condition with rough and raised edges. Finally, the decent leather sheath came with the inside three rivets rusted too and a white mildew on the inside of leather strap that closes on the blade. Still functional and attractive but I didn't mean to buy a new project/chore. Response: Hello Amanda, we would first like to apologize for the condition you received your dagger as this is unacceptable. One of our customer service reps have gotten with you to refund your money for this item. Once again we do apologize for any inconvenience this may have caused you. Best regards, BUDK customer service. Loved the daggers,very beautiful, and fairly well made. I must say the sheath that came with this one was junk,wish they had sent me the leather one,like they did with the other dagger. But overall I'm satisfied,as they are only wall hangers. I got these Daggers as a BOBO buy and as my first purchase with the Night watchmen flashlight/stun Gun I also reviewed today. I am very satisfied with the Quality of the blades and the Handles. The handles at first were a little loose and the blades a bit dull but easily fixed by this woman. And since my simple fixes, the blades have stayed sharp and the handles have stayed firm. this is the only reason I gave them four stars. They are well balanced in my hands, and beautifully done otherwise. Again BUDK totally Impressed with my first purchases and have been spreading the word about you guys, with my hunting/ wild photography Buddies up here in Montana. You'll see me buy more soon. Again thank you BUDK! Really amazing quality for the price. That is real brass and horn. It may be made in Pakistan, but that is what keeps the price down. Many fine swords, knives and daaggers are coming out of India and Pakistan and China. A big European market decades ago sent European metalsmiths abroad. These eastern countries soon produced quality swords, daggers, knives and other metal items up to quality spec. As a former metalsmith, I was far underpaid for my time, it takes many hours and a lot of hammering, filing and sweating to produce something by myself. I never broke even. 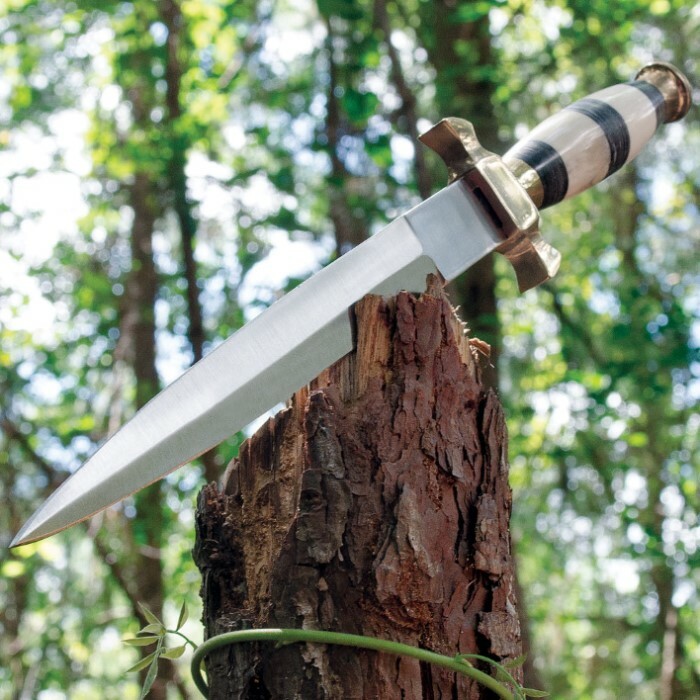 To make a quality dagger, sword or knife at a nice price means multiple people doing multiple jobs, not one guy at a forge, a polisher, a torch or a hammer. You want American or Canadian, this would cost you more than 10 times the price. In my opinion, its a lovely piece. You are getting a deal. Nice piece of work on the bone and horn handle, the brass brings out the authentic of the dagger, the blade is sharp and solid, great work on the leather sheath its heavy duty. The price was a good deal and recommend it. Thanks CH Kadels for the special buy one get one free. This is a sturdy piece; with great looks too. It has a good leather sheath, well secured. The steel is superior and the edge is sharp to a perfect point. Solid brass hilt fits and feels great in hand. Got this on BOGO! Great piece for the bucks! Needed some sharpening,so thats what it got! The second is for my son for his B-Day next month! Thanks BUDK!!!!!!!!!!!! Pretty fancy looking knife at a low price. The horn grain looks great, but I was a bit disappointed in the look of the bone. My knife had a misfit marking on one of the bone sections. I would have preferred not to have this mark if I had the opportunity to hand pick the knife myself, but its still a nice looking knife. I guess the mark does add a little character to the knife. Very authentic, very sharp; handle is genuine bone and horn. It's like something an old muleskinner would carry. Highly recommend this for your collection!